Your memory is good — true, 39 years ago we brought the news of California’s admission into the Union. Where are those who were our fellow passengers? Except for yourself, I cannot recall the name of one living! We ought to be thankful that our lives have been spared to behold the wonderful march of events of this prolific age! Unfortunately, Blake’s letter to Bidwell recalling the great day does not survive. Blake had a very good memory for his California days, and it would be nice to have his recollections. Headline of the Daily Alta California, Extra Edition, Oct. 18, 1850. Both were passengers on the steamship Oregon, arriving on October 18, 1850 with the news that California had become the 31st state on September 9th. Bidwell was traveling in a first class cabin, while Blake, a farm boy on his way to the goldfields, was in steerage. Bidwell carried with him the statehood documents. Traveling with him were his Maidu valet Rafael, Samuel J. Hensley, H.A. Schoolcraft, who had traveled to Washington with Bidwell, Mrs. Elijah Crosby and her daughter Helen, and Bidwell’s brother Thomas. By 1889 all these but Helen Crosby, who had married Hensley, had passed away. And John Bidwell, who had been Hensley rival for her hand, had forgotten all about her. 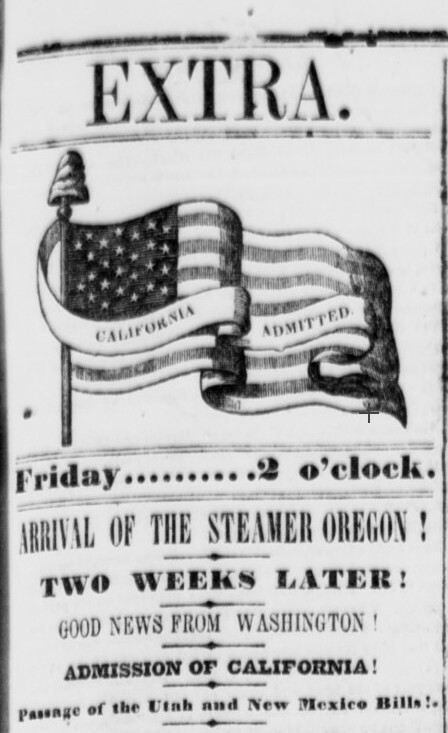 The Oregon steamed into San Francisco Bay, firing cannons and decorated “from stem to stern and from the taffrail to the maintop” (as the Daily Alta California reported) with fluttering flags to announce the long-awaited news. Jubilation erupted throughout San Francisco as the citizens celebrated with bonfires, marching bands, booming cannons, and all-night balls. We don’t make much of Admission Day presently, which is too bad. If you want to celebrate, there is an event on Wednesday, Sept. 9th at 11:00 a.m. in Oroville at the Liberty Pole at Montgomery and Huntoon Streets.